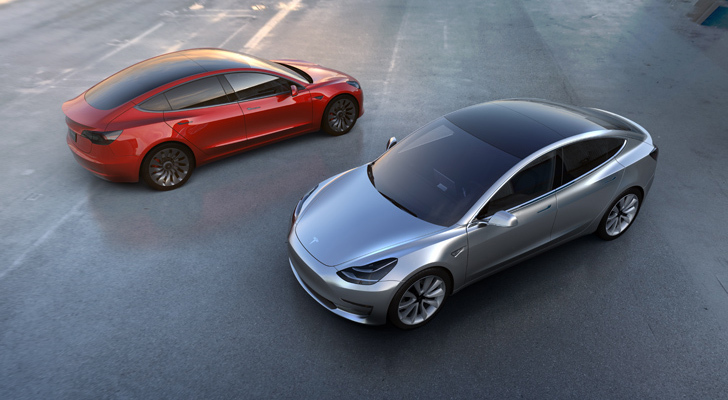 UBS analyst Colin Langan is the latest bear to rain on Tesla’s (NASDAQ:TSLA) parade, issuing a $190 price target on Tesla stock and reiterating his “sell” recommendation on the shares. Langan’s beef with Tesla stock has to do with the $2.90 per share profit that TSLA reported for the third quarter, well above analysts’ consensus estimate of a 15-cent loss per share of TSLA stock. Langan believes that regulatory credits accounted for $1.06 per share of Tesla stock in Q3 or 37% of its overall profit in the quarter, substantially lowering the quality of the results reported by TSLA on Oct. 24. They are credits earned by the company for producing zero-emission vehicles (ZEV). Several U.S. states, most notably California, have legislation in place that requires auto makers to sell a minimum number of zero-emission vehicles each year in those states. Companies that don’t meet the standards buy credits from Tesla and other electric-vehicle manufacturers in order to comply with the laws. Tesla’s profit margins on the credits are nearly 100%. While the analyst is right to assume that the regulatory credits that boosted Tesla’s results and Tesla stock in Q3 likely won’t be present in Q4, he’s wrong to think that Tesla’s earnings won’t be nearly as bright without them. As I look at Tesla’s 10-Q regulatory filing for Q3, I have a hard time understanding what Langan’s problem is. The analyst seems to suggest that TSLA was hiding the existence of these credits in order to make its profits look better than they were. However, if you look in the 10-Q, you’ll see the credits are listed as a revenue source for the company. Tesla’s credits of $137.2 million in the quarter were significantly higher than the $19.5 million in credits a year earlier. The sale of these credits is based on long-term contracts that Tesla has with buyers . They’re based on Tesla’s production volumes. Naturally, as Tesla’s volumes have grown over the past year, the credits it has amassed and sold have increased dramatically. Go back to the Q3 2017 earnings release, and you’ll find that there is no mention of the $19.5 million of credits for that quarter. Look at the 10-Q, and you’ll see that the credits are included in automotive revenues. Sloppy and inconsistent reporting? Perhaps, but I’d hardly call it a case of Tesla trying to mislead investors. It’s not Tesla’s fault that it produces nothing but electric vehicles and therefore is entitled to significant revenues from the sale of these credits. They exist to incentivize auto manufacturers to make and sell more energy-efficient vehicles. Plain and simple. If the $1.06 per share of automotive credits are excluded from Tesla’s bottom line profits, TSLA still had $314 million of net income in Q3, a significant achievement for a company which is supposedly bleeding cash. I believe Tesla stock is worth a lot more than $420 per share, the price that Elon Musk proposed for a take-private deal in August. With or without the credits, TSLA will continue to grow its business. Little by little, the company’s income statement and balance sheet will get healthier, and the issue surrounding the credits will disappear like all the other arguments against it. From where I sit, investors should still buy Tesla stock. Article printed from InvestorPlace Media, https://investorplace.com/2018/11/the-latest-bear-argument-against-tesla-stock-has-no-teeth/.